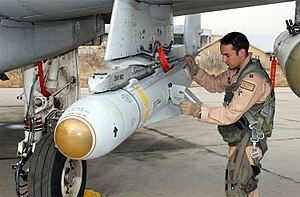 A pilot inspects an AGM-65 Maverick missile on his A-10 Thunderbolt II. A Taurus KEPD 350 cruise missile of the German Luftwaffe. An air-to-surface missile (ASM) or air-to-ground missile (AGM or ATGM) is a missile designed to be launched from military aircraft at targets on land or sea. There are also unpowered guided glide bombs not considered missiles. The two most common propulsion systems for air-to-surface missiles are rocket motors, usually with shorter range, and slower, longer-range jet engines. Some Soviet-designed air-to-surface missiles are powered by ramjets, giving them both long range and high speed. Guidance for air-to-surface missiles is typically via laser guidance, infrared guidance, optical guidance or via satellite guidance signals. The type of guidance depends on the type of target. Ships, for example, may be detected via passive radar or active radar homing, less effective against multiple, small, fast-moving land targets. There is some cross-over between air-to-surface missiles and surface-to-surface missiles. For example, there was an air-launched version of the Tomahawk missile, superseded by the AGM-86 ALCM. Other missiles used in both roles include the Penguin and AGM-84 Harpoon anti-ship missiles. Many air-to-surface missiles can be used against both ships and land targets, although some must be modified to perform a different role; for example, the AGM-84E Standoff Land Attack Missile is a land-attack version of the Harpoon. A major advantage of air-to-surface missiles for ground attack by aircraft is the standoff distance they provide: missiles can be launched from a distance without coming within range of the target's air defences. Most air-to-surface missiles are fire-and-forget from a standoff distance, allowing the attacker to withdraw without approaching further after launch. Some missiles (typically cruise missiles or anti-ship missiles) have long enough range to be launched over the horizon, finding the target autonomously. Typically, the higher and faster the launching aircraft is flying, the longer the reach of a particular missile is. For long-range missiles this difference can be relatively small, but short-range missiles (like the AGM-65 Maverick) have a much longer range when launched at altitude. There have been examples of air-launched ballistic missiles (Air Launched ICBM), but they are rare. Sometimes air-to-surface missiles are divided into the categories of tactical and strategic. Typically missiles with chemical explosive or small nuclear warheads are classed as tactical, and large nuclear warheads as strategic. FOG-MPM Fiber Optics Guided Multiple Purpose Missile. ^ "USAF reveals slimmed-down SACM air-to-air missile concept". Flightglobal.com. 2016-02-25. Retrieved 2018-10-18. ^ "Raytheon to research tactical missile capabilities". ^ "Textron explores capabilities for next-generation GBU-X munition". 19 November 2015. ^ "Small Advanced Capabilities Missile - Cord Master Engineering". 29 February 2016. ^ "Next Gen Kh-32 ant-ship cruise missile tests drawing to a close in Russia".